The 3D Water Matrix is a robot conceived to create liquid artworks. 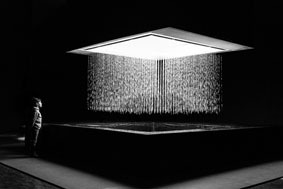 Composed of 900 computer-controlled valves, it allows to make water sculptures and animated and three-dimensional works, where the water droplets replace pixels. It was elaborated with the technical collaboration of Lumiartecnia International -based in Spain-, the famous engineering company specialized in liquid architecture. The first creations, ST\LL by Shiro Takatani (JP) and The Sorcerer's Apprentice by Christian Partos (SE) premiered at the Cité des sciences et de l'industrie in Paris in 2014/2015, then were presented in Karlsruhe and Rome. A third piece, GHOST, designed by Ulf Langheinrich (DE), whose first version was presented during the exhibition "Body Media II" at the Power Station of Art in Shanghai in 2017, completes the repertoire of the matrix and has been also presented in Brussels and Maubeuge.